Hey there, mystery vine... - Welcome to The City of Desire. For the past two years we've been watching this little clematis sprout in our front border garden mature to the point where it could actually produce flowers. 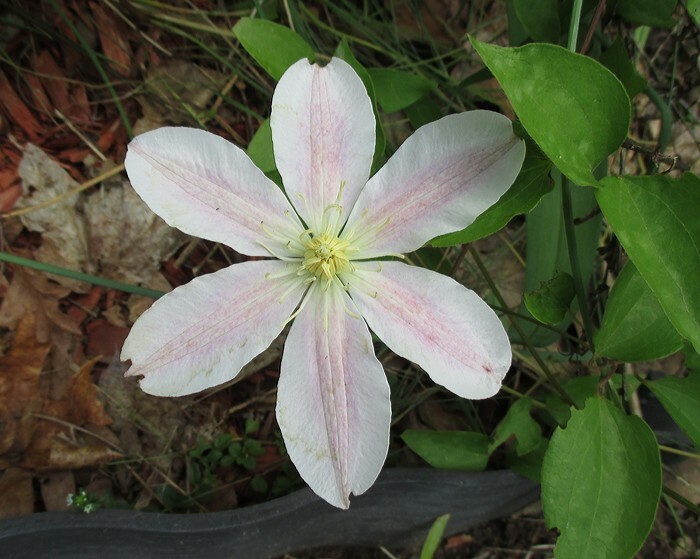 Since it popped up in the same spot as our dear departed Lemon Chiffon, we assumed that it was an old clematis that got whacked by an idiot struggling to grow back. But lo and behold, it is no such thing! I have no idea what this clematis is. It's growing close to Gillian Blades, but it has a completely different shape and color. I thought that it might be a spawn of Gillian and Haku Ookan, but now that I study it closely it has dark pink veins in the center like Will Goodwin. So maybe Gillian Blades and Will Goodwin had a baby? Is it really uncommon to have your clematis mate without your intervention? I am so exhausted right now, because I just planted the giant Carding Mill in the bed in front of our new white fence. My arms aren't working right. I don't even know if my brain is working right.